So remember a while back I blogged about a play I was excited about, called Scratcher? That's part of a season of three plays, called In The Future When All's Well. Did I mention that? No, I didn't. Well, the second one is called Shifting, by a young chap called John Kennedy. He is a nice person. 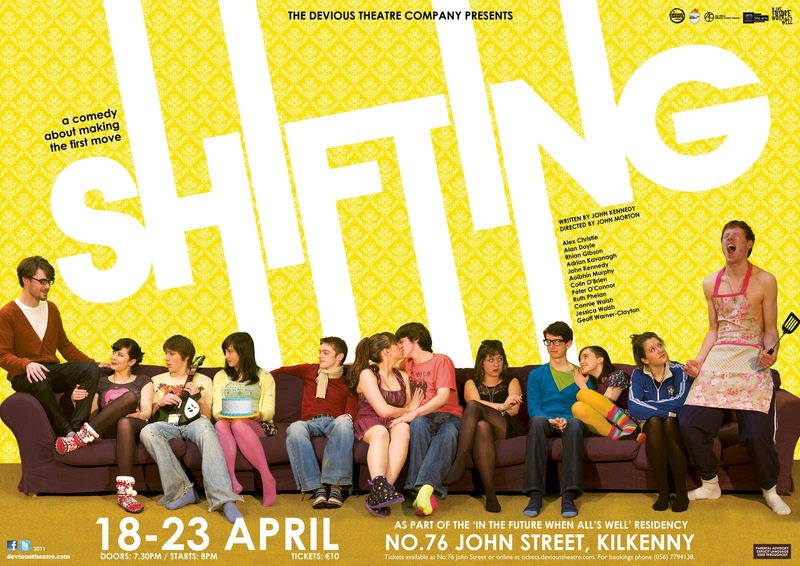 Shifting is a comedy about making the first move. The bittersweet story is centred around a birthday party in the suburbs of Kilkenny City where a group of childhood friends try to have one last hurrah together before going their seperate ways into adult life. But as the night progresses, this final flirtation with their teenage years degenerates into a booze soaked mess of accusations, confessions, cake and unwanted gatecrashers. It's being directed by John Morton, who also directed, wrote, and starred in Scratcher, and is being assistant directed by me. Sorry for my absence, but I really have been busy! I have a valid excuse! I'm assistant directing a play, this play, and it's brilliant! The whole experience! Everyone's so nice, and it is truly an honour to get to do this. Ha, Google Chrome just put a red squiggly line under honour. Stupid American spelling. But anyway. You know, it'd be nice if people came. Shifting opens on April 18th and runs until April 23rd in No. 76 John Street, Kilkenny. It's the first week of the Easter holidays, so if you're around, you probably won't have anything else to do. Apart from come. Tickets are €10, but on the first night, Monday April 18th, they're only a fiver. These fiver tickets can only be bought at the venue, and the rest of the tickets can be booked at DeviousTheatre.com or booked on 056 – 7794138. I know it's unrealistic to ask a lot of you to come, like the people who live in a different time zone. But if you live near-ish, I'd love to see you there. Oh, and I wrote a little blog for the Devious Theatre website. Here it is. There's pictures and everything. P.S. For those who don't know, shifting is an old slang word in Kilkenny for kissing. Get it? EPIC! I am so jealous of you, I'd love to do something like that! Your blog is so good! I'm using too many exclamation marks! If you want to pay for my flight over, I'd so be there :P but failing that, good luck and hopefully everything will go well! !